HERE below is a funny, fascinating potted history of 14 coups in Sudan, including the latest, written by Africa specialist Dr. Alex de Waal. It's a must-read. The essay is full of interesting details bringing its readers up to date with what is happening in Sudan right now: Sudan “is poised between an inspirational transformation and dangerous disorder. 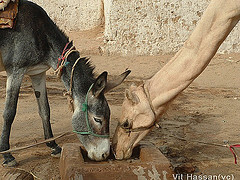 Sudan’s democratic moment is still desperately fragile”. After reading the essay, and going by the last 16 years here at Sudan Watch and miles of reports, I’ll be surprised if Sudan suddenly becomes a stable democracy, I fear there are too many violent opportunistic factions involved, all vying for power (click here to read UN Security Council briefing on Sudan 07 Feb 2019). Also, South Sudan is still in turmoil, parts of its border still being negotiated, poor people in South Sudan still suffering much grief and hardship, not a lot has changed for the better since the country gained independence from Sudan in 2011 (click here to read UN Security Council briefing on South Sudan 14 Mar 2019). While reading today's news about Sudanese protestors staging a sit-in in Khartoum to demand civilian rule, I thought of the violence gripping Libya ever since its strongman leader Muammer Gaddafi (07 Jun 1942 - 20 Oct 2011) was horrifically murdered in Libya by his people (click here to read UN Security Council briefing on Libya 05 Apr 2019). And the violence continuing in Iraq ever since its strongman leader Saddam Hussein (28 Apr 1937 - 30 Dec 2006) was returned to Iraq by the US and hanged by his people (click here to read UN Security Council briefing on Iraq 03 Dec 2019). 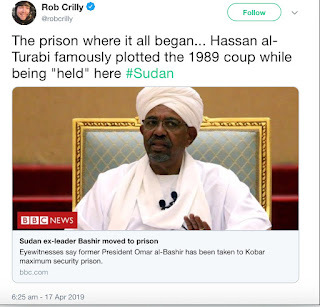 Maybe that is why Sudan's strongman leader Omar al-Bashir is now, reportedly, being held in a high security prison in Sudan's capital of Khartoum, to save him from facing the same fate as Messrs Gaddafi and Hussein. On a lighter note, while reading the essay, I laughed at the coupists commandeering a train to storm Khartoum only to find themselves shunted into a siding by an unwitting signalman. Also, the story of a failed coup launched mid-afternoon while government officials were asleep during a customary nap. And a failed coupist who left Sudan for Ireland and shortly after having a great idea to write a cartoon history of coups in Sudan was hit and killed by a car in London’s Euston Road while rushing to join an opposition meeting! Note that the 1989 Islamist coup was notable in part because Omar al-Bashir and his fellow rebels were stone cold sober. On the morning of Thursday 11 April, the Sudanese army announced that they would shortly be making an announcement. Radio and TV were already broadcasting ominous martial music. Tens of thousands of protesters, massed outside the Ministry of Defence, waited patiently. For months they had been calling for President Omar al Bashir to step down. Six hours later, the somewhat strained figure of General Awad Ibn Auf, the defence minister and vice president – and in that capacity heir apparent to Bashir – appeared on TV to say that the army had taken over and a further announcement would come before long. He looked unwell and sounded indecisive. On Friday 12 April, Ibn Auf quit and another senior general, Abdel Fattah Burhan, took the presidential oath of office. No one had a clue about his character or politics; commentators speculated that his relative obscurity must mean he was an apolitical figure ready to preside over a compromise. An hour later he made an overture to the protesters, a vast crowd whose discipline and fortitude compares impressively with the disarray of the security chiefs: it was obvious that the generals’ pact was unravelling once Salah Abdallah Gosh, the head of the National Intelligence and Security Services (NISS), announced his resignation too. Sudan saw 14 coups between independence in 1956 and the Islamist putsch in 1989 that brought Brigadier Omar al-Bashir to power. Khalid el Kid, who tried to seize power as a young colonel in the 1970s and later became a lecturer in English literature in Ireland, had the idea in 1990 of writing a cartoon history of them. He was killed shortly afterwards, hit by a car on the Euston Road while dashing to join an opposition meeting. One of the books in his library was a 1975 graphic novel by Hergé, the creator of Tintin, portraying Jaafar Nimeiri’s putsch of 1969, and his dramatic escape from an attempted counter coup two years later. Most of the coups took place in the middle of the night – the officers involved having boosted their courage with a drinking session – and the population woke either to martial music and the voice of a new military man on the radio, or the announcement that a treacherous subversion had been repressed. In one of the failed attempts, military units commandeered a train to storm Khartoum, but a railway signalman who wasn’t in on the deal switched the points and sent the insurgents into a siding. In 1971, communists caught the government off guard by launching their coup in the middle of the afternoon, during the siesta hour when most people were asleep. (It was reversed after three days, with Nimeiri’s escape from detention, much relished by Hergé.) The 1989 Islamist coup was notable in part because Bashir and his fellow officers were stone cold sober. Ba‘athist officers tried to overthrow Bashir during Ramadan the following year. The Islamist security services summarily executed 28 of them. For almost thirty years there were no further coup attempts. By chance or design, Bashir created an apparently coup-proof system of rule. As well as a proficient spy network, he used two tools, one obvious to all, the other more subtle. The overt coup-proofing method was to divide and rule the security forces. The NISS, with tanks and helicopters at its disposal, could put up a formidable resistance to any army units. Soon after taking power, Bashir also created the Popular Defence Forces, an umbrella term for various paramilitary outfits, including some which were loyal to the Islamist party. There are also oilfield security units, Border Intelligence (former Darfurian Janjaweed), Central Reserve Police and, the biggest of the lot, the Rapid Support Force, which also grew out of Darfurian Arab militia. Seven thousand RSF troops are deployed in Yemen on Saudi Arabia’s payroll, and the RSF commander, Mohamed Hamdan Hemeti, became one of the main powerbrokers at military HQ in Khartoum. Without a unified military capable of taking control of the capital, it looked as if Bashir would be immune to the fate of his predecessor Nimeiri, who lost power in April 1985 when the army command decided to ‘stand with the people’ during a civilian uprising – the path followed by the Egyptian army when it deposed Hosni Mubarak during the Arab Spring. The leaders of the different forces only had to get together with the army chiefs, however, and Bashir would be out. This is what happened on the morning of 11 April. Bashir’s other, less conspicuous kind of armour was loyalty and reciprocal trust. After the killing of the 28 ‘Ramadan martyrs’, the president made sure that no officer was executed or extradited. In 1995, when a group of officers were caught red-handed trying to assassinate Mubarak at a summit in Ethiopia, Bashir demoted them or cycled them out of power but made sure they were not handed over to the Egyptians or Ethiopians. He was a generous, sociable patron. Twice a week he held open house for army officers at his residence in the vast military HQ compound in Khartoum. Any soldier with the rank of captain or above could drop by. Bashir was friendly, solicitous and helpful. He was also accommodating to the provincial aristocracy of tribal chiefs, who served as militia commanders, and to paramilitary leaders. The result was a prodigious level of personal intelligence about what was going on. While Gosh and the NISS spied on people – NISS and Gosh’s own private companies have a stake in Sudan’s mobile phone networks – and broke up opposition cells using detention, torture and agents provocateurs, Bashir was like an uncle to every man in the sprawling security apparatus. Everyone trusted him to stick to the unwritten rules. Bashir customised the system of government and security as a show which only he could run, as his successors are quickly discovering. When international human rights activists condemn Bashir for his brutality and call for him to face trial at the International Criminal Court, they misunderstand the social norms that have kept his regime together. When the ICC indicted his subordinates, Bashir stood by them, and so far they have insisted that they will not extradite him to The Hague. On Wednesday, he was transferred from house arrest to Kober prison, where generations of political prisoners have been jailed, including the elected parliamentarians he overthrew thirty years ago. It’s also where the prison service protects its professional ethos: Bashir won’t be mistreated there. Kober is a symbolic humiliation but not an ejection from the elite. The civility of the Sudanese elite crosses political divides, to the astonishment – and perplexity – of foreign mediators dispatched by the UN or Western governments to try to resolve Sudan’s wars. When they meet in a Kenyan hotel for talks, the leaders of warring groups, whose fighters are killing one another in rural Sudan, will embrace, exchange greetings and inquire after one another’s families. Political rivals in Khartoum celebrate at each others’ family weddings. Political assassinations or executions have always been rare and in the last 25 years they were almost unheard of. These norms helped Bashir to hold onto the presidency, but they also ultimately broke him. During his last years in office, he used his formidable political talents simply to stay in power, and did nothing for the country. Anti-government protests erupted last December, first against the high prices of bread and fuel, and then against Bashir’s endless rule and the corruption that accompanied it. Despite weekly demonstrations in Khartoum and other cities, Bashir imagined he could outlast the protesters. He thought they lacked leadership and would be easily divided, bought off or demoralised. He was wrong. On 6 April – the anniversary of the popular uprising that brought down Nimeiri in 1985 – the biggest ever crowds surrounded the Ministry of Defence and military HQ, and refused to disperse. By then about fifty people had died in the protests. Given the size of the demonstrations, it is a relatively low figure – more than 200 were killed in two weeks of protests in 2013. Army officers would not order their units to fire on the crowds. Among the demonstrators were the sons and daughters of their friends, colleagues and family members; sometimes their own children. One brigadier said his daughter came home from the protests asking him not to shoot her friends. The violence since last December – live ammunition, high concentrations of tear gas, beatings and torture – was perpetrated by the NISS and militia groups. When Bashir’s security chiefs met in their besieged HQ on 6 and 7 April and gave orders to disperse the crowds, the paramilitaries were ready to do it, but the regular army wasn’t. On two successive nights, army units opened fire on the paramilitaries in defence of the protesters. Bashir knew all the political intrigue among the middle and senior ranks of the military, but failed to anticipate the doggedness of the protesters and had no idea how to respond to their demands. There had been opportunities to democratise the country – the Sudanese were willing to put up with him until the elections scheduled for April 2020, provided he opened up the political scene in a credible way. He began a ‘national dialogue’, which looked promising until he insisted on chairing it; he announced a new constitutional convention, but too late for the opposition parties to take it seriously. He was too cautious to venture any meaningful concessions. The Alliance for Freedom and Change consists of 22 opposition organisations, including the Sudan Professionals Association, coalitions of political parties, Girifna (‘we have had enough,’ a movement of young people), the Forum of Sudanese Tweeters and the families of the Ramadan martyrs. They and the demonstrators outside the walls of the military HQ have been more disciplined and cohesive than the generals within. They issued a declaration on 1 January, the anniversary of Sudan’s independence, calling for Bashir to be replaced by a transitional civilian council, to govern for four years and prepare the way for a genuine democracy. When General Burhan offered to talk on 13 April, some opposition leaders said the alliance should simply present its demands and refuse to negotiate; others said it would be better to enter into a dual authority arrangement with the army. The Sudan Revolutionary Forces – a coalition of armed insurgents in Darfur and the ‘two areas’ of Southern Kordofan and Blue Nile, who have been fighting for years – said it was too early to enter talks. This made the civic opposition leaders’ hearts sink: the southern rebel leader John Garang refused to join the civilian government in 1985, in nearly identical circumstances, arguing that he could get more by continuing to fight (and went on to do so for another twenty years). If the civic opposition can seize the day, they could well set the agenda in their talks with a disoriented soldiery. If they cannot, the situation could quickly deteriorate. Gosh’s resignation is a warning. He is a merciless operator and no one expects him to go quietly into retirement. The security bosses all have foreign ties: the Islamists (currently sidelined by the coup) have backers in Qatar and Turkey; Ibn Auf may be gone but others in the high command are close to Egypt; Burhan and Hemeti have led troop deployments in Yemen on the Saudi payroll; Gosh is close to the United Arab Emirates. The security hydra – multitudinous, avaricious, with each faction backed by a rivalrous foreign patron – poses an ominous threat. Eleven years ago, Hemeti and his Darfur Arab militia mutinied to demand a better deal from the government that had armed them and dispatched them to fight. The Channel 4 journalist Nima Elbagir filmed Hemeti as he negotiated his return to Bashir’s fold. In a dusty clearing in the bush, Hemeti held a meeting to sound out the views of his men and secure their backing, and then demanded a financial package from Khartoum. He switched back to fighting for the government when he got what he wanted. It’s a rare and compelling insight into a how a true specialist in violence operates in Sudan’s political marketplace. Sudan, in other words, is poised between an inspirational transformation and dangerous disorder. It is still a beneficiary of the social codes that limit violence within the elite and in the cities. Sudan’s democratic moment is still desperately fragile. In the essay above, the author, Alex de Waal, mentions the name Tintin. I had forgotten all about Tintin. My late father, who had a great sense of humour, often used the word “Tintin” to describe something or someone or other. Now, thanks to the Internet and Wikipedia, I know what he meant. Here are some snippets. The Adventures of Tintin is a series of 24 comic albums created by Belgian cartoonist Georges Remi, who wrote under the pen name Hergé. The series was one of the most popular European comics of the 20th century. By 2007, a century after Hergé's birth in 1907, Tintin had been published in more than 70 languages with sales of more than 200 million copies, and had been adapted for radio, television, theatre, and film. The series is set during a largely realistic 20th century. Its hero is Tintin, a courageous young Belgian reporter and adventurer. He is aided by his faithful dog Snowy. Other protagonists include the brash and cynical Captain Haddock and the intelligent but hearing-impaired Professor Calculus, as well as the incompetent detectives Thomson and Thomson and the opera diva Bianca Catafiore. The series has been admired for its clean, expressive drawings in Hergé's signature "clear line" style. Its well-researched plots straddle a variety of genres: swashbuckling adventures with elements of fantasy, action, mysteries, political thrillers, and science fiction. The stories feature slapstick humour, offset by dashes of sophisticated satire and political or cultural commentary. Tintin is neither a surname nor a first name, it is much more than that Tintin is a totally unique world, a myth or a saga. Tintin is created from Hergé’s subconscious desire to be perfect, to be a hero. The hero who everyone between 7 and 77 years old wants to be, or become while reading the Adventures of Tintin. “Tintin is me wanting to be heroic and perfect …” “Tintin is me… my eyes, my feelings, my lungs, my guts!… I believe I am the only person able to animate him, the only person to give him a soul. TRANSCRIPT: UK Channel 4 News Lindsey Hilsum’s interview on 09 Oct 2008 with Sudanese President Omar al-Bashir at the Presidential Palace in Khartoum, Sudan. Throughout the interview Mr Bashir spoke English. Sudan's former President Omar al-Bashir has been moved to Kobar maximum security prison, days after he was deposed in a military coup. Reports say the ex-leader has until now been detained at the presidential residence under heavy guard. The Sudanese Army has deployed troops around the defence ministry, on key roads and bridges in the capital Khartoum. There are reports the head of the ruling party and the former vice president have been detained. Thousands have flocked to the streets of the capital - and joined a sit-in outside the military headquarters. That protest has been taking place since Saturday. Earlier, state television said the armed forces would make an important announcement, amid speculation a coup attempt could be under way against President Omar al-Bashir. It follows months of protests against his 30-year rule. Al Jazeera's Hiba Morgan reports. Al Jazeera is funded in whole or in part by the Qatari government.